Imagine if our MPs used the mobile dating app Tinder to campaign during an election. The media would have a field day! And yet scientists from the University of Otago and the University of Canterbury are using this exact tactic to campaign for the critically-endangered kakī (black stilt) in Forest & Bird’s annual Bird of the Year competition. The result? A fresh take on science communication that goes beyond the “conservation bubble” and reaches an entirely new demographic. It may sound like a bird-brained idea, but there are over forty years of research and conservation work behind the plan. Kakī are one of the rarest wading birds in the world. With just 132 adults left in the wild, they are rarer than the famous kākāpō, takahē, and black robin. While these birds are rare, few New Zealanders know of this staunch, fierce, and fabulous wading bird. Kakī are endemic to braided river habitats in New Zealand, and used to be found on the North and South Islands. But, following the introduction of mammalian predators and habitat loss, their population began to decline. By 1981, only 23 birds remained in Te Manahuna/The Mackenzie Basin, and intensive management including a captive breeding programme were initiated to prevent extinction and enhance recovery. Early conservation work faced the question of whether kakī were a ‘real’ species requiring conservation. When the kakī population became very small, some kakī bred with their closest relatives, the poaka or pied stilt, creating concern that even kakī with typical all-black plumage were merely hybrids in disguise (i.e., a hybrid swarm). So far, all DNA testing has confirmed the species boundaries between kakī and poaka (Steeves et al. 2010, Chambers & MacAvoy 1999, Wallis 1999), with the question currently being revisited with genomic data by researchers at the University of Otago. It turns out more questions were able to be answered using DNA. For example, field biologists started noticing 5-egg nests in the wild, which is strange as kakī usually have clutches of 4 eggs. To make things weirder, one of the offspring of these 5-egg nests looked more like a poaka than a kakī. Using DNA markers, researchers were able to show the social parents of these 5-egg nests are not the biological parents of all the eggs, and that mischievous stilts were dumping eggs into other birds’ nests (i.e., brood parasitism). These same DNA markers could also address problems associated with severe population decline. During this bottleneck, kakī likely experienced a loss in diversity, which can limit how a population can respond to novel challenges like a new disease or climate change. These small populations inevitably result in breeding between closely related individuals (for example, brothers mating with sisters). Using DNA, researchers were able to show that when closely related kakī mate with one another, they hatch fewer chicks. To avoid inbreeding and maximise diversity, researchers at the University of Canterbury are investigating the best methods for matchmaking kakī in captivity. 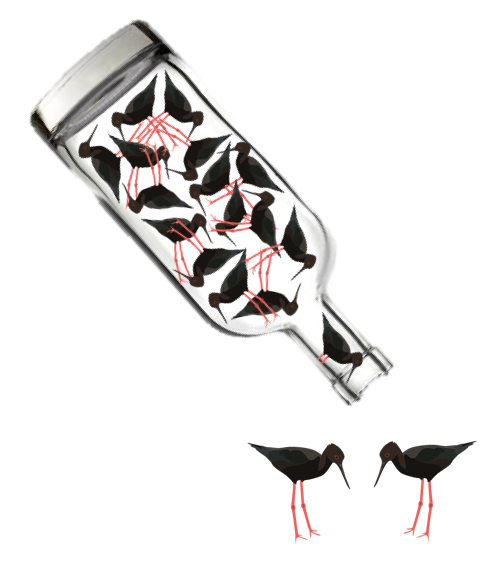 This research on kakī pairing decisions led to the ‘Tinder for Kakī’ concept. For every bird in captivity, there is a profile of pedigree and genomic relatedness between potential bachelors and bachelorettes, with birds having the final say over whether they ‘swipe right or left’, resulting in final pairing decisions. While University of Canterbury PhD candidate Stephanie Galla was drafting her Three Minute Thesis talk, her lab mates from the Conservation, Systematics, and Evolutionary Research Team (or ConSERT) decided to set up a novelty account for their lab mascot, Shelly the kakī, as a fact-finding mission for the presentation. Tinder users were curious about why a bird was on the dating app. The team quickly realised that Tinder could be a tool for science outreach, allowing for one-on-one conversations with people outside of the science and conservation bubble. Tinder matches gained insight into the challenges kakī were facing, and were armed with a way to help — by voting to spread the word. By the time Bird of the Year began, Shelly had matched with over 500 people across three major New Zealand cities and beyond, which is pretty good for a critically-endangered and little-known bird. With over 35,000 total votes by day 9, Bird of the Year is achieving its goal of raising awareness for the state of New Zealand’s avifauna. To ‘swipe right’ on kakī, head to www.birdoftheyear.org.nz.